as some of the most innovative and expressive examples of art from the Italian Renaissance. Born at the cusp of the 15th century to a family active in the textile industry, Luca della Robbia became a successful marble sculptor by the 1430s, famous for his reliefs of music-making children for a choir gallery in the Cathedral of Santa Maria del Fiore. LEFT: Luca della Robbia, Cantoria (organ loft), 1431–1438, marble, Museo dell’Opera del Duomo, Florence. Photograph courtesy Opera di S. Maria del FioreRIGHT: Luca della Robbia, Panel from the Cantoria, 1431–1438, marble, Museo dell’Opera del Duomo, Florence. Photograph: Erich Lessing/Art Resource, NY. 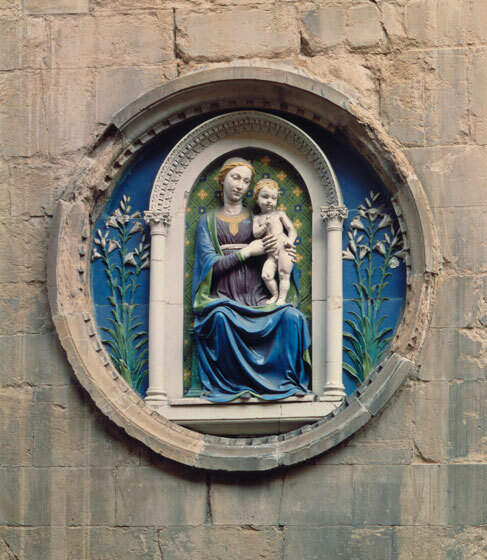 Some 40 examples illustrate the range of sculptural types produced by Della Robbia workshop—Madonna and Child reliefs, architectural decoration, portraits, household statuettes, and large-scale figures in the round. Luca’s invention. Praised around 1435 by the art theorist Leone Battista Alberti as a leading contemporary Florentine artist alongside Donatello, Ghiberti, Masaccio, and Brunelleschi, Luca went on to secure his rank as one of the most important Florentine artists of the Renaissance by inventing a glazing technique—and with it an entirely new art form. The form uniquely combined durable terracotta (baked clay) with the brilliant colors of painting and the shine of vitreous glaze. 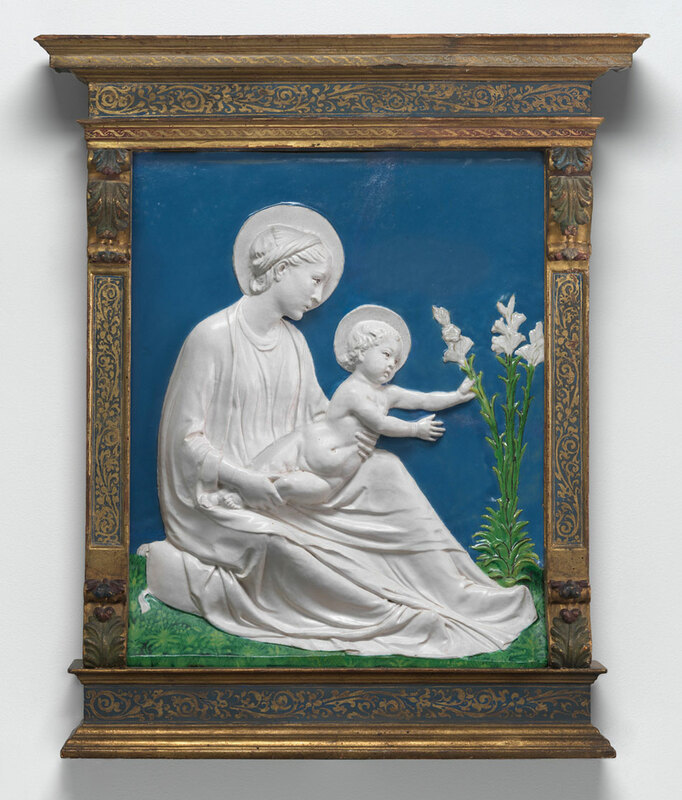 With Luca’s invention, the Della Robbia workshop flourished and produced sculptures for the secular and sacred, public and private spaces of Florence. 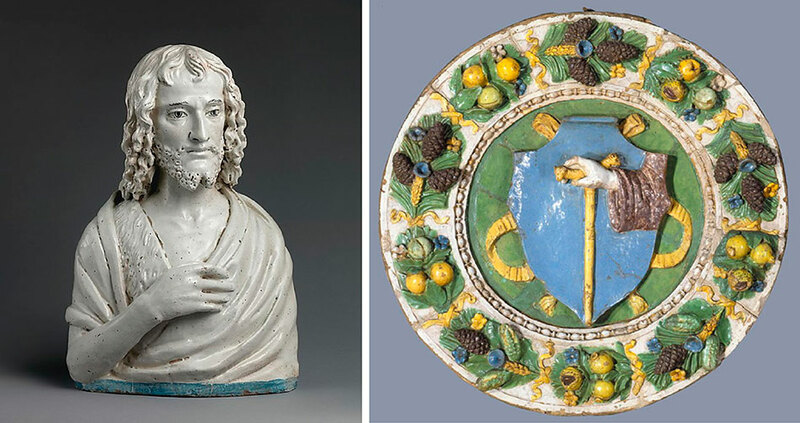 Their recognizable ceramics could be found across the city and beyond, in courtyards, churches, hospitals, and the homes of a wide range of patrons, including Piero de’ Medici. who trained with Luca and took over the workshop when Luca’s health began to decline. who learned the technique from his father and carried on the family enterprise. The exhibition also includes sculptures by Giovanni’s brothers Luca the Younger (1475–1548) and Girolamo (1488–1566), three of the five sons of Andrea (a father of 12) who carried on the family art form. Under Luca’s supervision, the workshop developed techniques and practices to help meet high demand. With plaster molds, they could easily replicate their most popular models while also varying the details by hand in the wet clay and, after a first firing, in the glazes. 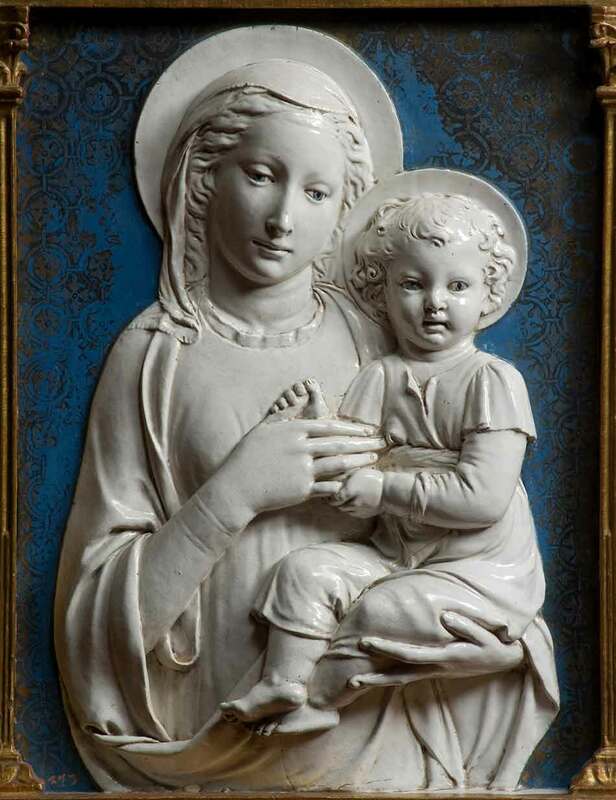 The exhibition features two pairs of reliefs probably made from the same molds, including examples of the most popular subject for domestic settings, the Madonna and Child. “Madonna and Child “(c. 1475) from the Gallery’s collection and “Virgin and Child with Lilies” (1460/1470) from the Museum of Fine Arts, Boston, show clearly how alterations—the addition of angels, Christ’s tighter grip on the lilies, details in higher or lower relief, different styles of painting with glazes in the grass—could individualize serial sculptures. Luca della Robbia, “Virgin and Child with Lilies”, 1400 – 1482, glazed terracotta, overall: 48 x 37 cm (18 7/8 x 14 9/16 in. )Museum of Fine Arts, Boston. Gift of Quincy Adams Shaw through Qunicy Adams Shaw, Jr., and Mrs. Marian Shaw Haughton. 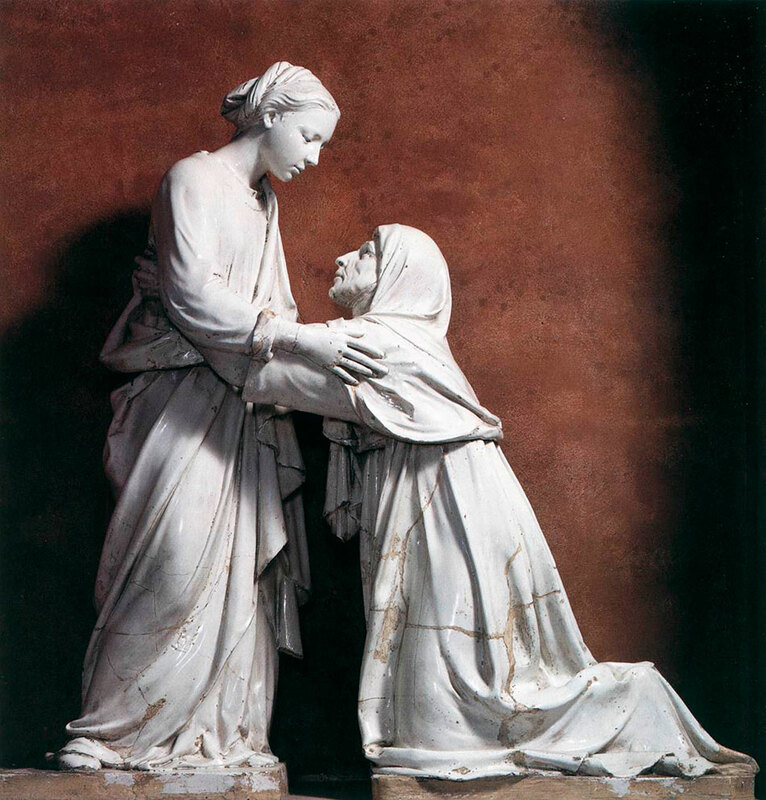 Many commissions, such as “The Visitation”, were designed with a specific setting in mind. The quietly powerful sculptural group, a masterpiece of 15th-century art in any medium, was generously lent by the Church of San Giovanni Fuorcivitas, the Diocese, and the city of Pistoia for its first trip to the United States. The nearly life-size composition depicts the emotional moment from the Gospel of Luke when the pregnant Virgin Mary is welcomed by her elderly cousin Elizabeth, pregnant with St. John the Baptist. Formed fully in the round, the two figures were fired in four individual pieces that fit securely together. Following its time in Washington, the beloved work will return to Pistoia, designated as the Italian Capital of Culture in 2017. Luca della Robbia, “The Visitation”, 1400 – 1482, glazed terracotta, overall: 151 x 148 x 60 cm (59 7/16 x 58 1/4 x 23 5/8 in. )Church of San Giovanni Fuorcivitas, Pistoia. Luca della Robbia, “Madonna and Child”, c. 1441-1445, glazed terracotta, framed: 120 x 79.5 x 17 cm (47 1/4 x 31 5/16 x 6 11/16 in.) image: 63 x 50 x 14 cm (24 13/16 x 19 11/16 x 5 1/2 in.) Museo Nazionale del Bargello, Firenze. 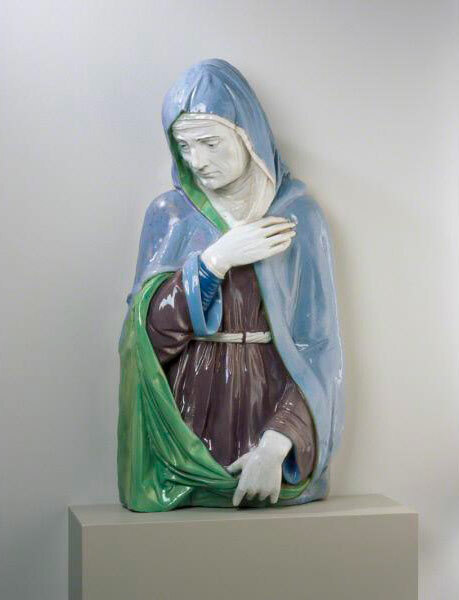 Andrea increased the production of serial sculpture and the shipment of Della Robbia works to clients beyond Florence. He developed Luca’s techniques with figures of heightened elegance, giving particular attention to the details of hairstyles and costumes, and carried on with nature study especially in images of children. The resplendent garlands of fruit and flowers surrounding many of the works, introduced by Luca, were enriched and expanded by Andrea, as in the Roundel with “Bust of a Young Boy” (c. 1470/1480, Detroit Institute of Arts) and “Prudence” (c. 1475, The Metropolitan Museum of Art). 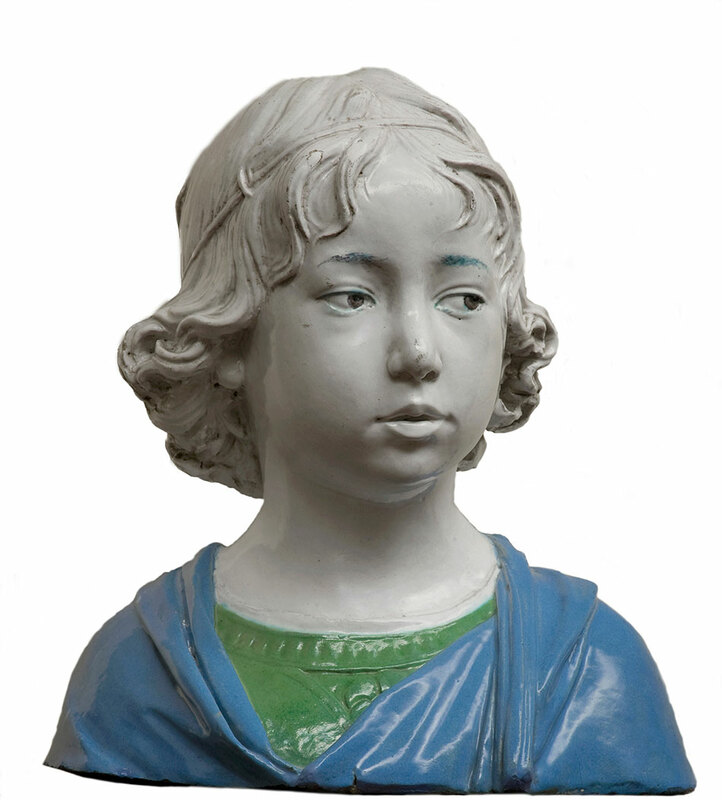 Head of a Youth Andrea della Robbia, “Bust of a Young Boy”, c. 1475, glazed terracotta, overall: 13 x 11 13/16 x 7 7/8 in. (33 x 30 x 20 cm), pedestal: 1 13/16 in. (4.6 cm) Museo Nazionale del Bargello, Firenze. Andrea della Robbia, “Prudence”, ca. 1475, glazed terracotta, overall: 164.5 cm (64 3/4 in.) weight: 1223 lb. (554.749 kg) Lent by The Metropolitan Museum of Art, Puchase, Joseph Pulitzer Bequest, 1921. Andrea made effective and expressive use of his uncle’s color palette, as in the blue and violet shades that envelop his “Mother of Sorrows” (c. 1525, Saint Louis Art Museum). Yet in the 1490s, when Andrea became a follower of the reformist preacher Fra Girolamo Savonarola, he explored a new, more austere naturalism in devotional sculpture, with flesh areas of holy figures sometimes left unglazed to suggest their humble origins from earth. 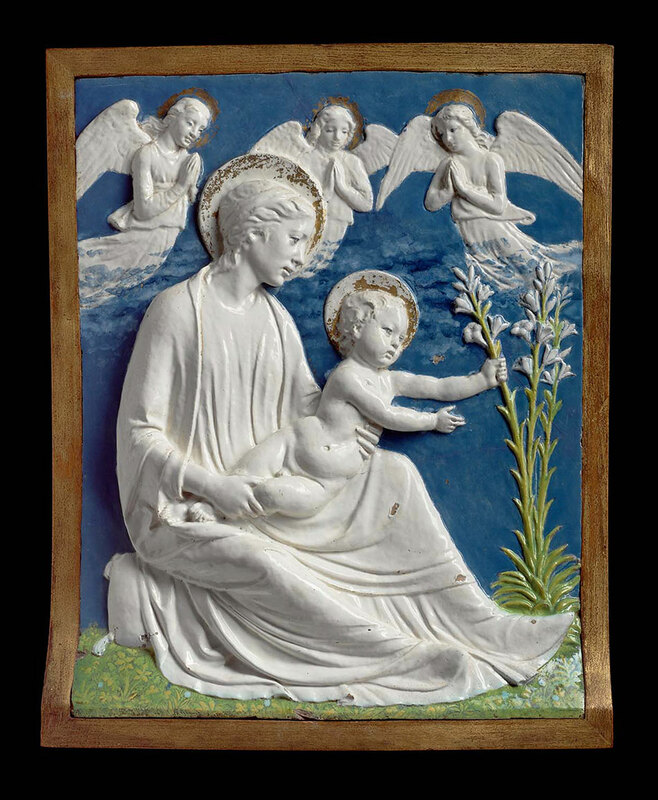 Giovanni della Robbia, Andrea’s son, continued to explore the naturalism pursued by his father. A highlight of the exhibition, Giovanni’s monumental “Resurrection of Christ” (c. 1520/1524, Brooklyn Museum) is installed in the first room, atop the entrance to the West Garden Court to recall its previous home on a garden gate at the “Antinori family villa outside Florence”. The masterpiece depicts a life-size Antinori patron (probably Niccolò di Tommaso, 1454-1520) in prayer below the blessing right hand of Jesus, with the family coat of arms on the lower corners of the exuberant botanical frame. To prepare for its departure from Brooklyn for the first time since its donation in 1898, the more than 12-foot-wide lunette underwent a year-long conservation treatment supported by the current generation of the “Antinori family”, who also provided generous support for the exhibition. 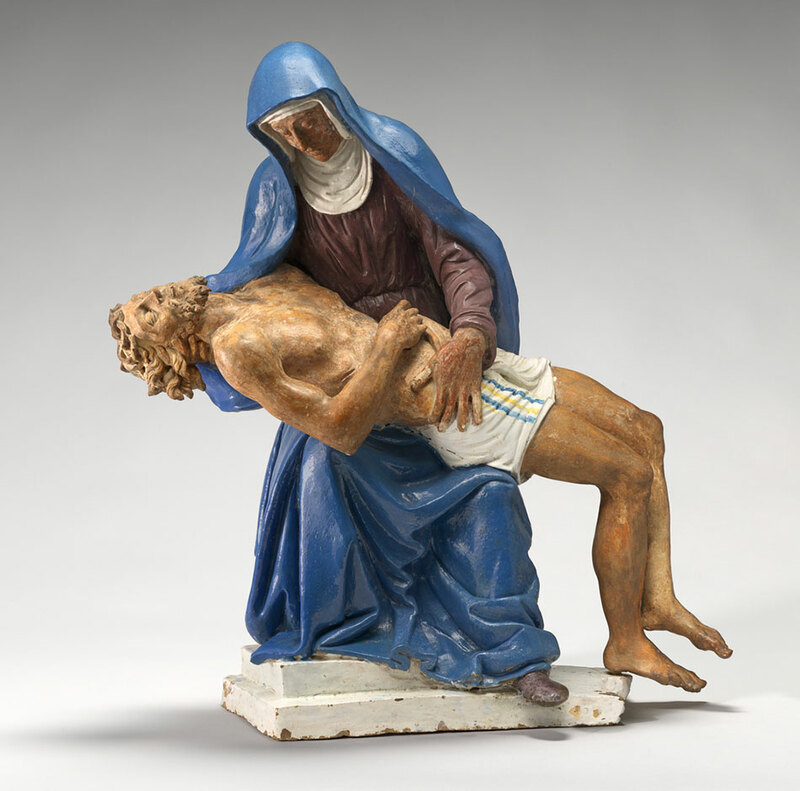 Giovanni della Robbia, “Pietà”, c. 1510/1520, glazed terracotta, overall: 72 x 44 x 32.7 cm (28 3/8 x 17 5/16 x 12 7/8 in. )Samuel H. Kress Collection. By the time of Giovanni’s death, his siblings Luca the Younger and Girolamo had left Florence for France to focus on commissions for “King Francis I”, whose portrait by Girolamo from 1529 (on loan from The Metropolitan Museum of Art) is on view in the exhibition. 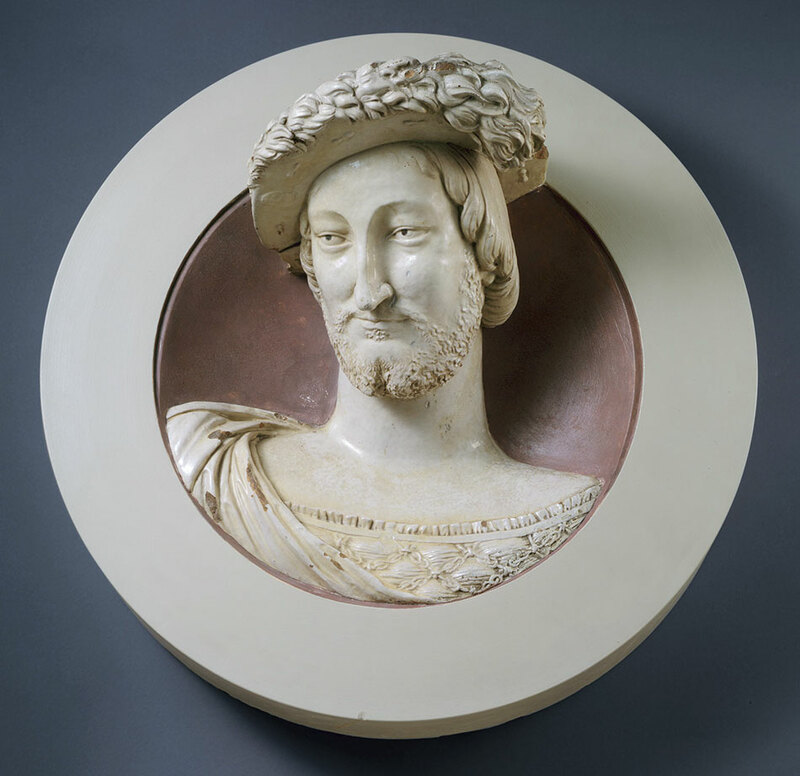 Girolamo della Robbia, “Francis I” (1494-1547), King of France, 1529, glazed terracotta, overall: 44.5 cm (17 1/2 in.) Lent by The Metropolitan Museum of Art, Gift of George Blumenthal, 1941. Girolamo della Robbia, “Bust of a Man”, 1488 – 1566, glazed terracotta, overall: 46.36 x 40.01 x 19.69 cm (18 1/4 x 15 3/4 x 7 3/4 in.) The J. Paul Getty Museum, Los Angeles. In the Kress Collection, Andrea’s “Adoration of the Child” (after 1477), belonged to the celebrated English arts writer John Ruskin in the late 19th century. The exhibition provides a virtual walking tour of Florence, Italy, where many important works of Della Robbia sculpture remain immured in their original settings and cannot be transported for exhibition. 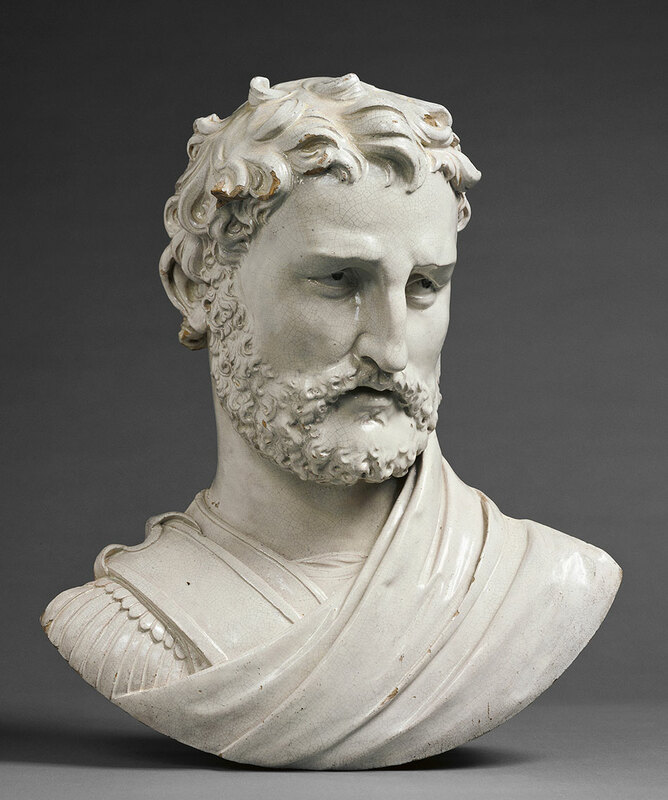 During the 15th and 16th centuries, the family’s terracottas adorned palaces and public spaces throughout their native city. The patronage of the ruling “Medici” clan enhanced the prestige of glazed terracotta, and the medium was also prized by guilds and religious institutions for its beauty, legibility, and durability. Commissions for large-scale decorative schemes embedded in the walls of buildings brought the workshop into collaboration with other masters of 15th-century Florentine art, such as the architect “Filippo Brunelleschi “(1377–1446). Even today, sculptures by the Della Robbia figure prominently in the fabric of Florence, from street corners to the cathedral. LEFT: Luca della Robbia, “Resurrection”, 1442–1445, Santa Maria del Fiore, Florence. Photograph: Scala/Art Resource, NY. RIGHT: Luca della Robbia, “Ascension”, 1446–1451, Santa Maria del Fiore, Florence. Photograph: Scala /Art Resource, NY. Orsanmichele, Florence. Photograph: Scala/Art Resource, NY. LEFT: Attributed to Luca della Robbia the Younger, “Coat of Arms of the Franciscan Order”, c. 1525, North Carolina Museum of Art, Raleigh. 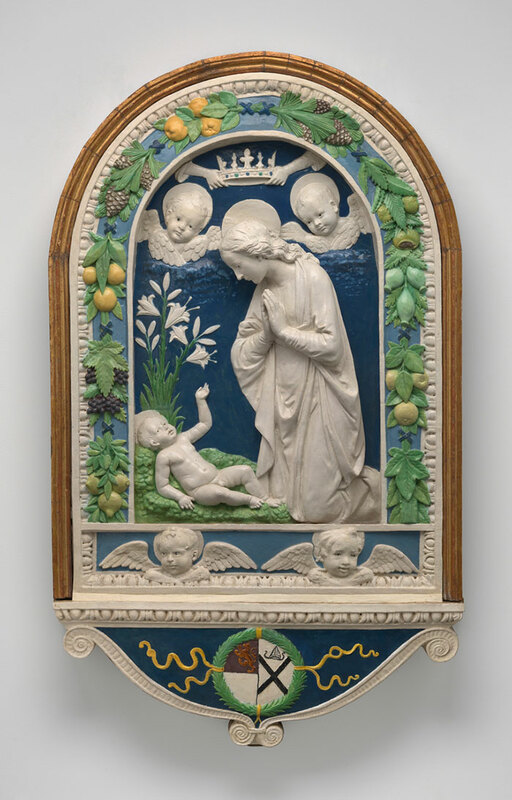 Purchased with funds from the North Carolina State Art Society (Robert F. Phifer Bequest), G.55.25.2RIGHT: Luca della Robbia, “Madonna and Child”, c. 1450–1460, Oratory of San Tommaso Aquino, Florence. 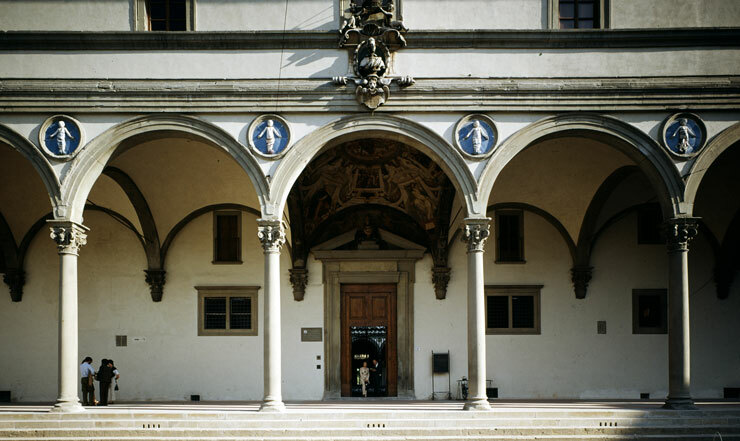 Photograph: Emanuele Vergari Fotografo, Firenze. Conservation of this work was made possible through the support of Friends of Florence. sculptures installed 1487, Florence. Photograph: Bridgeman Images. Photograph: Universal Images Group North America LLC, DeAgostini, Alamy. Church of Santa Croce, Florence. Photograph: Scala/Art Resource, NY. 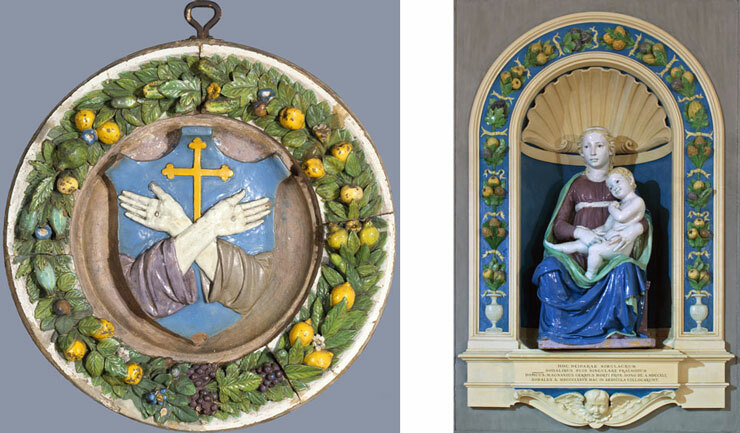 Displayed among the Della Robbia works are sculptures by a rival firm—Benedetto Buglioni (1459/1460–1521) and his apprentice and distant relative, Santi Buglioni (1494–1576). The Buglioni workshop capitalized on the popularity of glazed ceramics and attempted, with uneven success, to create sculptures that extended the technique and material to their limits. 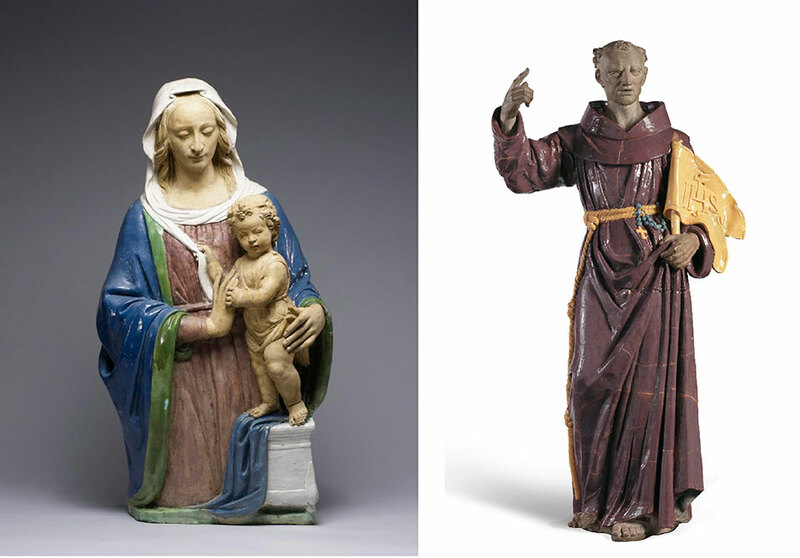 Santi Buglioni’s three five-foot-tall preaching saints—brought together from an American private collection, the Los Angeles County Museum of Art, and the Gallerie degli Uffizi—are impressive for their scale and charismatic presence, but proved difficult to fire, as indicated by the large cracks and peculiarities visible in the glazed surfaces. 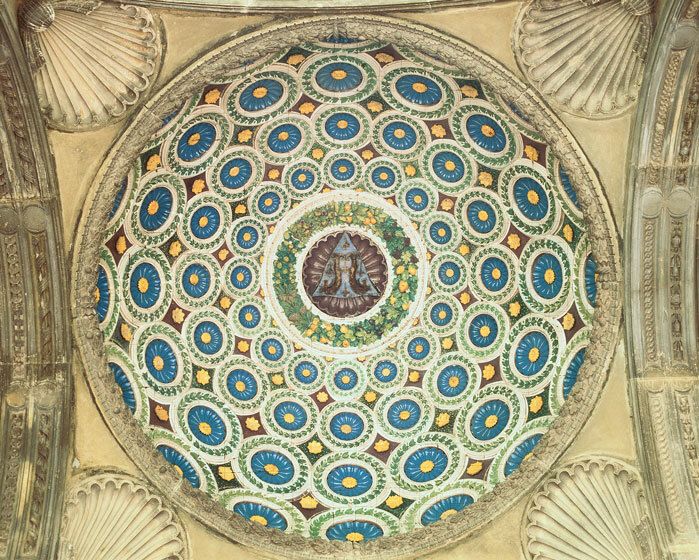 The Buglioni workshop was the last in Florence to use the Della Robbia technique. It is often assumed that Luca used terracotta because it was inexpensive and easier to work with than marble. His invention, however, had its own qualities not offered by marble: color, of course, but also brilliant luminosity, legibility at a distance, and resistance to inclement weather. The Della Robbias’ process, moreover, involved careful and laborious preparation of clay as well as extensive experimentation with the interaction of clay and glaze. Recent technical research by scholars and conservators at the MFA, the Gallery, the Brooklyn Museum, The Metropolitan Museum of Art, and the Walters Art Museum has revealed the sculptor’s thorough understanding and manipulation of the materials. The raw, calcium-rich clay was gathered from riverbeds, likely at a family-owned property along the Arno River. While Luca would have been familiar with clay as a material for preparatory models for works in bronze and marble, he selected it carefully for sculptures and developed an extensive refinement process to make it suitable for glazing. After an initial firing, the cooled ceramic body would be covered with glazes composed of ground glass and metal oxides with an alkali flux, then fired again to produce a hard, colorful, gleaming surface. The secrets involved the proportions of ingredients and the unique interactive relationship between the particular clay and glazes used. The recipe for the secret Della Robbia glazes included a greater ratio of lead and tin to other ingredients, which enhanced the final opacity and brilliance, particularly of the white figures that stood out against colored grounds. Forerunners included not only the Renaissance glazed ceramics known as maiolica, but also the luxury art of enamel work on metal; Luca was reportedly trained as a goldsmith. The inventive glazing technique has kept the colors just as vibrant today. 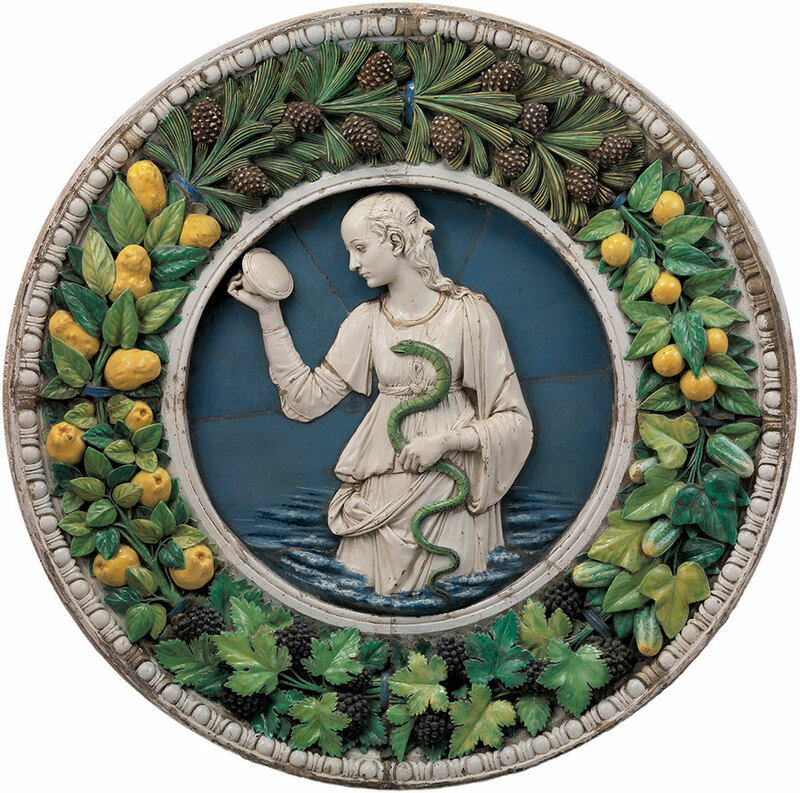 Numerous American collectors, led by discerning Bostonians including Charles C. Perkins, Quincy Adams Shaw, and Isabella Stewart Gardner, brought Della Robbia works back from Italy. These now grace some of the 18 U.S. collections that lent to the show. 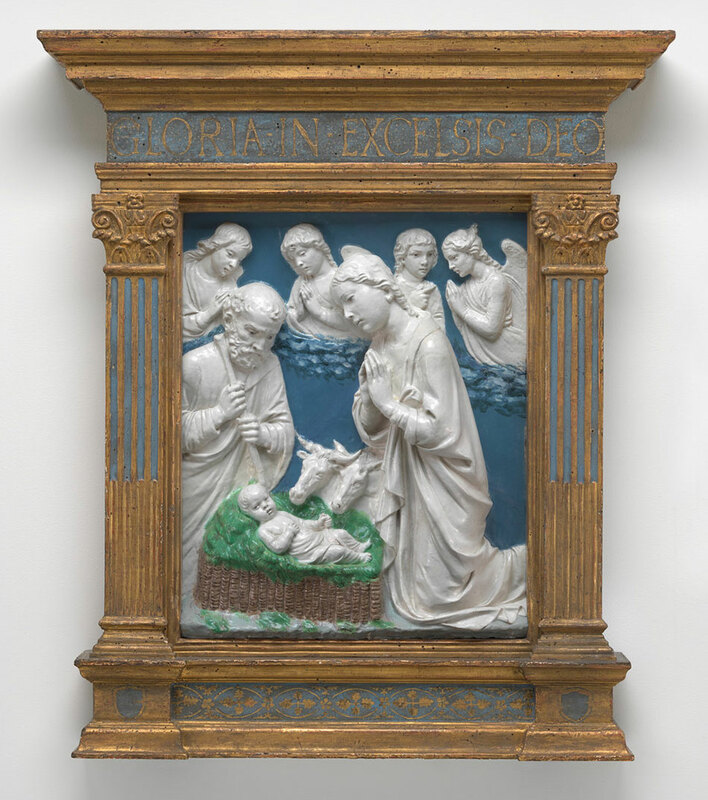 Pioneering scholarship on the Della Robbia, still fundamental today, was carried out by an American, Allan Marquand (1853–1924), inspired by an Andrea della Robbia altarpiece owned by his father (now in The Metropolitan Museum of Art). 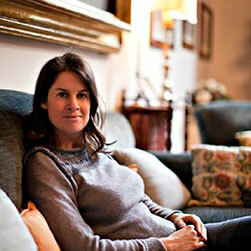 Alessia Antinori, the 26th generation of the Tuscan winemaking family. 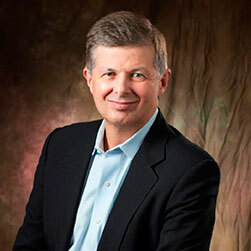 Ted Baseler, President and CEO of Ste. Michelle Wine Estates. This catalog accompanies the National Gallery of Art exhibition “Della Robbia: Sculpting with Color in Renaissance Florence”, featuring the brightly hued and technically sophisticated ceramics of a Renaissance master and his workshop. The exhibition is organized by the Museum of Fine Arts, Boston, in association with the National Gallery of Art. This exhibition is made possible by Altria Group on behalf of Ste. Michelle Wine Estates, and by Marchesi Antinori S.p.A. Major support is provided by Sally Engelhard Pingree and The Charles Engelhard Foundation, and the Buffy and William Cafritz Family Foundation. 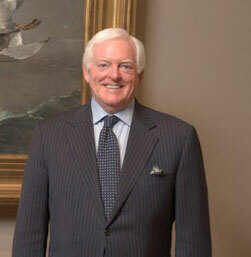 Additional funding is provided by The Exhibition Circle of the National Gallery of Art. Hours: Monday–Saturday, 10 a.m.–5 p.m. Sunday, 11 a.m.–6 p.m.